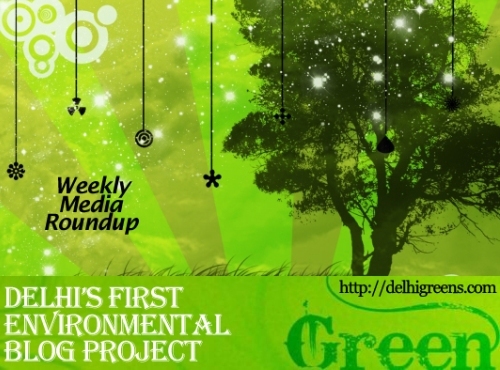 Weekly green news update from across different media networks for week 20 (between May 16 to 22) 2016. The Centre for Environment and Energy Development on Friday launched the ‘Help Delhi Breathe’ campaign to curb air pollution in the city. With only two weeks left for the monsoon to hit the city, desilting of drains by civic bodies and land-owning agencies is on at a frenetic pace. The Arvind Kejriwal-led Delhi government on Monday told National Green Tribunal that the pollution level remained high in the national capital during the second phase of odd-even car rationing scheme. The National Green Tribunal has issued notice to South Delhi Municipal Corporation to show cause why coercive steps be not taken against it for failing to stop construction on the Saket storm water drain allegedly by authorities at a gurudwara. The national capital is all set to get its biggest waste-to-energy plant by June. The National Green Tribunal on Thursday announced a penalty of Rs. 5,000 on anyone who is found dumping waste in the Aravalli Forest. Acting on a plea by an NGO alleging that the Delhi and District Cricket Association was using reverse osmosis-treated water for the upkeep of Feroz Shah Kotla ground and Tata Power Delhi Distribution was wasting 7,500 litres of water per day through the RO water plants it had installed at 31 educational institutions, the National Green Tribunal on Wednesday issued notices to the DDCA, Delhi Jal Board and TPDDL. It was five years ago that Delhi had its first tree census and that too not by a government agency but passionate citizens. In yet another successful crackdown on illegal trade in wildlife species in the national capital, an Indian black scorpion and a green vine snake, both protected species, were seized from a poacher here. There’s good news for the dirty Yamuna river in the Capital. Now a trash skimmer will clean the river and its various nallahs. Environment Ministry has proposed the establishment of a new Pollution Research Institute to look into all pollution-related aspects. Sharing his formula to create a pollution free environment in Delhi, Union Road Transport and Highways MinisterNitin Gadkari has said Delhi is not being polluted only due to diesel vehicles, adding vehicle pollution contributes around 17 to 18 percent. A CSIR laboratory in West Bengal has designed a ‘solar power tree’ that takes up only four square feet of space and produces about three kilowatts (kW) of power, enough to power about five households. A wildlife body today claimed that online retail giant Amazon has agreed to remove snares and traps from its website after it urged the portal to do so on compassionate grounds. Union urban development minister M Venkaiah Naidu on Tuesday said the Centre was keen on making installation of rainwater harvesting facilities mandatory in big buildings. The Union environment ministry plans to introduce a fresh set of civil penalties to enforce stringent norms it has imposed on diverse industrial sectors to reduce emission and pollution loads. Will the soaring temperatures this summer be catastrophic for the coral reefs of Lakshadweep islands?